As a Scripture was being publicly read in the church of my childhood I would sometimes watch my grandmother’s finger slide across the page of her Bible. As a small child I would light up when I could occasionally read a word or two. There is no other book like the Bible in its importance for people of all ages. It has always amazed me how God’s Word can seem so simple and yet so complex. Even when I am reading Scripture as I prepare lessons for infants and toddlers I am often astounded at a new concept that I had never noticed before. “Divine speech sometimes stirs up the clever with mysteries, but more often provides consolation for the simple with the obvious. It has out in the open food for children but keeps hidden away the things that fill the minds of the eminent with awe. Scripture is like a river again, broad and deep, shallow enough here for the lamb to go wading, but deep enough there for the elephant to swim”. Saint Gregory the Great: Moralia on the Book of Blessed Job, Section 4. Click here for full text. What a blessing to help lambs wade in God’s Word! As I teach children I want to be attentive to their stage of development and help them experience God fully. I usually have my own Bible open on the table when I am teaching so that children can see that I refer to it and respect what God says. In addition to my own Bible I want children to be very familiar with handling a Bible on their own. If at all possible I try to have bibles available for the children. Over the years I’ve developed a few measures for what children of various ages are able to do so I’m sharing them with you here in case you might find them useful in your teaching and at home. Allow the infants and toddlers to hold small Bibles. These should be inexpensive because they will inevitably, at one time or another, be chewed and pulled apart and the pages torn. 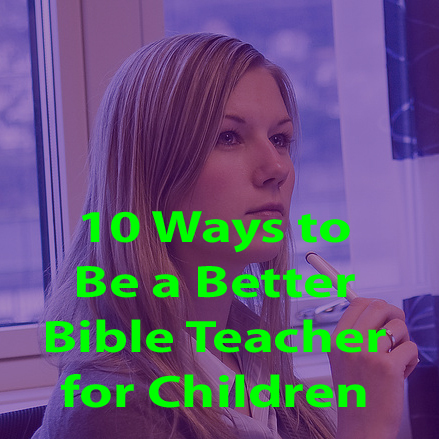 Show them how to hold the Bible carefully and how to turn pages. Place a sticker of Jesus inside the front cover so the children can “find Jesus” when they hold their bibles. Pre-Schoolers can look at pictures in a children’s Bible. If you do not have picture Bibles then tuck pictures between the pages of a Bible before class. Guide the children in pretending to read along with you as you tell a story or read a verse. Children of this age can learn to spell and write a few basic Bible words. I use magnetic letters or puzzles to do this. And of course they are learning to write letters at this age so they really enjoy just writing the letters. We practice one word over a few weeks until the children have it down. They are so proud of themselves! Children of this age can learn to recite the names of the 66 books of the Bible. I think it really helps to learn them by singing the songs. With help, children can find a book, chapter and verse in the Bible when given a Scripture reference. This is much easier to accomplish with a few children than a big group. Depending on their reading ability they can usually read a Bible verse that you have chosen (short and simple). Depending on reading level children of this age might be able to read a few verses in a row or even a very short Bible story. You will have to plan this carefully if children are reading out loud in class. This can be embarassing for some children and it does take time. Children in this age group can copy verses onto paper. These can be used in the classroom or taken home as reminders. Children aged 8-10 years are often able to confidently find a verse from a book, chapter, verse reference. A fun game is for the teacher to call out a reference (like Ephesians 6:1). The children then “race” to find the verse in their Bible and begin reading. By the pre-teen years children can usually read a set of verses or a Bible story of reasonable length from the Bible. Name the characters and describe them based on what they have read. What actions they might take based on what they have just read. No one is a PERFECT teacher! But everyone can be a BETTER teacher. You will not be able to improve without God’s wisdom and help. It doesn’t matter how good your teaching methods are if you are not accurately teaching the Word of God. Find out what they like to do in school. Ask them how they like to learn. Tips on Talking to Children. You will learn new things and find out which methods you would like to use and which methods would not. Even the most experienced teacher can be energised by observing someone else teach. Read books and articles about teaching. You will find books at the library, good Christian book stores, websites or Pinterest. Ask other teachers what books they would recommend. Learn to discern. Not every book in the library or every article on the internet is good. If you are not sure about something ask someone who is a mature Christian to help you understand. If you do something the same way every time you will become even more bored than the children. Teaching Ideas Here. You will never improve if you don’t give it a try. Spend extra time in preparation. If you are always preparing at the last minute then you will not improve. As a teacher you will probably learn more than the children do! After class take the time to think about what happened in your class. If I teach on Sunday morning I often spend a little time Sunday evening reflecting. What went well? What would you do differently next time? Teacher Reflection Template Another way to do this is to ask someone to watch you teach and give you feedback. I hope you will always try to improve as a teacher. God bless you as you teach!